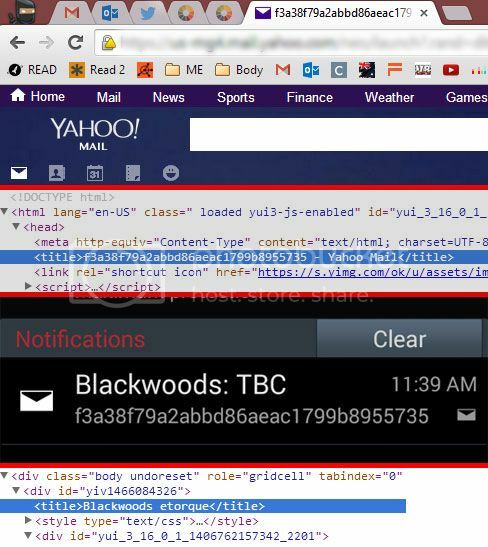 I am getting a Yahoo ID displaying on my desktop and my Android. The tab title dislays the ID number, which can be found in the snippet. Not a biggie, it's just a bit odd. On my phone, the notifications are also displaying this ID however which I'm scared looks a little spammy. The apps email list however does not display this. Is there anything I am missing that would overwrite this default setting? Or something I can do to only show my sender and subject, or even include my preheader? That's strange, not seen this one before. Could be something in your <head> or your Doctype maybe. Could you share your code. people tend to say either "it should be uppercase" or "it doesn't matter" but I don't think that's related to your issue. I just sent myself the code via PutsMail and it worked fine in my Yahoo account, Android native email and Yahoo app. Could you try sending to yourself via PutsMail too, see if that works for you as it could be an issue with the ESP you're using. Nothing when I do that test. And when I view my test emails at home, the issue doesn't show up. I'm actually working for the ESP, and we're testing before sending the email back to the client for sign off. I'll talk to our back-end guys, could be something that's being pushed by the system and only displays in our network. No worries, good luck with it.